After a very promising build up to the European Grand Prix, Lotus Racing leave Valencia relieved that Heikki Kovalainen and Red Bull’s Mark Webber both came out of a potentially very dangerous crash on lap 10 unscathed, and encouraged by Jarno Trulli’s race pace after a very unfortunate start to his afternoon’s work saw him make an early stop for a new front wing, before going on to finish 21st. Mike Gascoyne, Chief Technical Officer: “Obviously it was a very disappointing end to our 500th race. Jarno got hit at the start, and we had to change the nose. 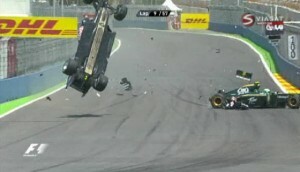 He also took a hit at the back, and that caused a gearbox problem. We were able to fix that and send him out again, although he was three laps down. He was held up by some of the other slower cars, but at the end of the race he was able to push and really show the car’s pace. 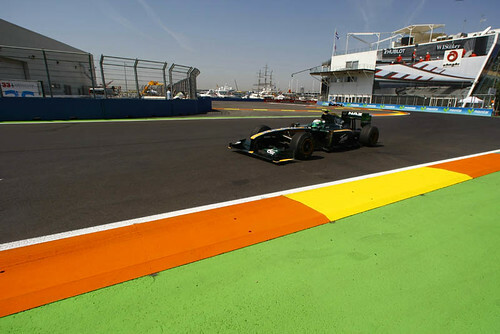 The European Grand Prix in Valencia, the ninth race of the 2010 FIA Formula One™ World Championship, is the 500th Grand Prix Lotus has competed in, an historic landmark in the Lotus legend. Lotus Racing will be celebrating this incredible milestone with Colin Chapman’s son Clive, who, with his family, will be representing one of the greatest names in Formula One™ history. He and the Lotus Racing team will be paying tribute to the legacy his father Colin created in single-seat racing in 1956 when he launched the Type 12, the car that will appear alongside the 2010 challenger, the T127, in the Valencia pitlane on Thursday evening. 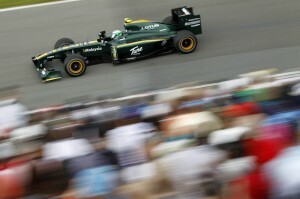 Lotus Racing will be celebrating the 500th race across the whole race weekend. 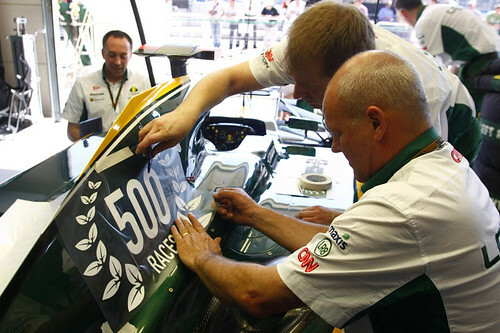 The T127’s of Jarno Trulli and Heikki Kovalainen will both be carrying a specially created “500” logo on their engine covers, and the team’s garages will also show off the logo that celebrates their heritage. An extended edition of Lotus Racing Notes, the team’s race-by-race newsletter, will be available online and in very-limited-edition hard copy from Thursday, as is a new podcast, and in the merchandise stands and online, “500” Lotus Racing team shirts and other memorabilia will be on sale. In the motorhome, the Lotus Racing catering team have been putting together a menu that each day features one of the favourite dishes of Lotus legends, including Sir Stirling Moss and Colin Chapman – more details will be announced each day…..
Heikki Kovalainen: “The last few races have been very positive for our team, we’ve been making progress every weekend and the plan is to carry on pushing. For Valencia, and for the rest of the season, we’re not looking back at the other new teams – we lapped them in Canada so we’re looking to keep taking the fight to the guys ahead, and I think we can do that. This is obviously an historic weekend for Lotus, and for Lotus Racing, and I think we’re starting to do justice to what’s gone before us – it’s fantastic that we can celebrate such a great milestone in Valencia, and it’ll be an honour to be part of that. Mike Gascoyne, Chief Technical Officer: “I’m really looking forward to this weekend, and am excited about both celebrating the 500th race Lotus has competed in, and helping add another chapter to one of motorsport’s greatest stories. 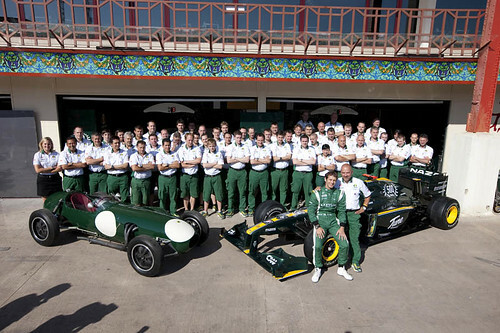 We’ve already come a long way this season, and have much further to go until we can add more glory to the Lotus legend, but I and the whole team are very proud to be in a position to help the Lotus name reach this landmark moment, and it’ll be great to celebrate that with Clive, Tony and the whole team. Clive Chapman: “Of course the 500th Grand Prix for the Lotus marque is a significant landmark, and it was nice that Lotus Racing thought to invite my mother to attend – after all, Hazel Chapman is the person with the closest association to the Team Lotus history. Much as she wanted to accept, regretfully she decided against it, so I’ll be there with my family representing Classic Team Lotus and my father’s legacy. 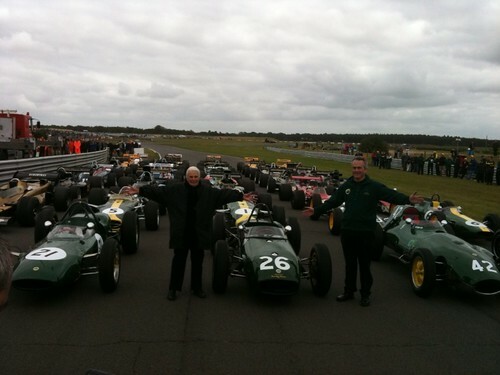 “The fact my mother won’t be in Valencia this weekend made it all the more special that she was with all the Team Lotus F1™ cars and the Lotus Racing T127 at the Classic Team Lotus Festival last weekend at Snetterton. It was a great moment for my family and me to see my mum and their grandma standing at the front of the 35 Lotus F1™ cars, and then to be joined by the Lotus Racing drivers. The ‘Valencia installation lap’ conducted at Snetterton by the T127 was another highlight of the day for everyone there. 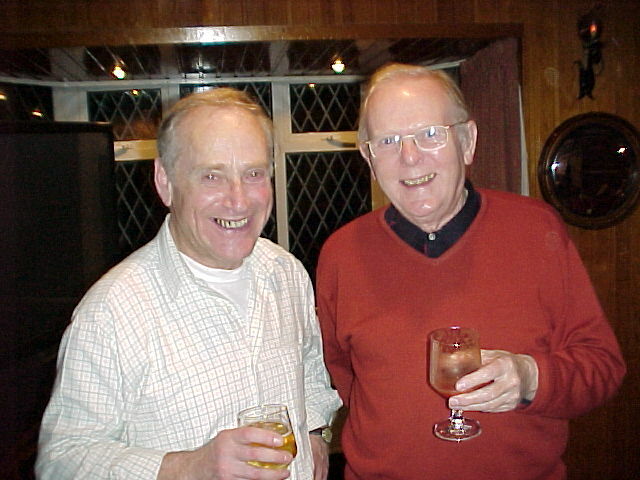 Peter Cambridge (above right), the designer of the Elite’s interior and other Lotus’ interiors, passed away over the weekend. Peter was deeply loved by his family and friends. Peter was part of the small team that were pulled from Ford (England) to work on and design the Type 14 Elite. 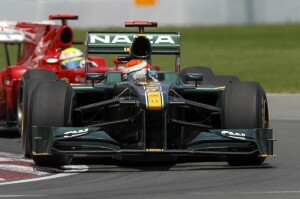 Even after leaving Lotus he remained active in the Lotus community in the UK. The Elite is frequently included as one of the iconic and most beautiful cars. The elegance is found both outside and inside. While it is unintentional the dash on the Evora mimics that of the Elite, proving how classic Peter’s design is. This event is not open to first time track drivers. You must have at least 2 prior track days experience, racing background, or completed a racing driver’s school before you can enter this event. 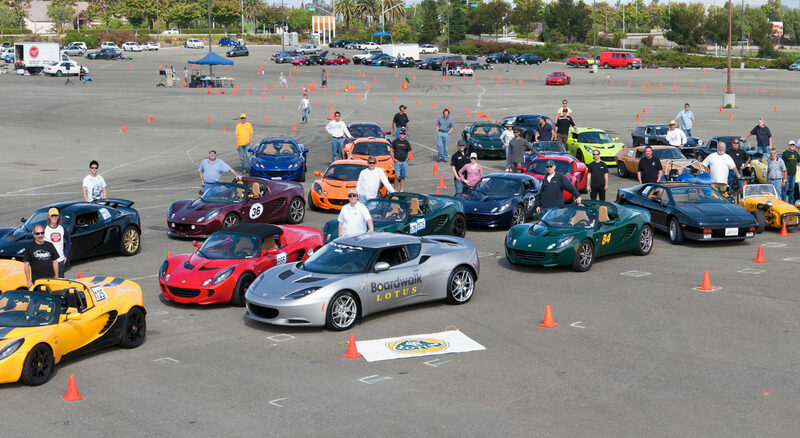 There are a number of track day organizations that are designed for training new drivers. Hooked On Driving is one group that we recommend for beginners to gain experience. There are others as well. 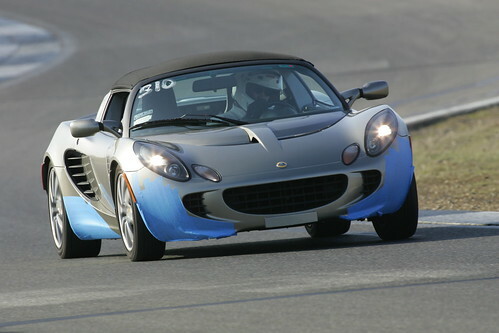 You do not need to own a Lotus to attend this event. We run our events totally non-profit and you will not find a better price for a full day on the track. The price for this event is $150 for GGLC members, and $170 for non-members. Additional drivers sharing a car are $50. You can become a GGLC member for $25. This event will be divided into 3 different types of groups on track; Novice, Intermediate, Advanced. The Novice and Intermediate sessions will have passing restricted to certain areas. The Intermediate passing rules will be slightly more liberal than the Novice rules. The Advanced sessions are open passing. Each driver can sign up as either Novice/Intermediate or Intermediate/Advanced. Novice/Intermediate drivers will not be allowed in the Advanced sessions. Intermediate/Advanced drivers will not be allowed in the Novice sessions. If you sign up for a particular group and decide at the track that you are not comfortable, ask a GGLC official to switch groups and it will probably be no problem. You must have a minimum of 2 track days experience to sign up for the Novice/Intermediate sessions. You must have a minimum 15 track days experience to sign up for the Intermediate/Advanced sessions. This event will be run in the standard counter-clockwise direction WITH THE BYPASS. 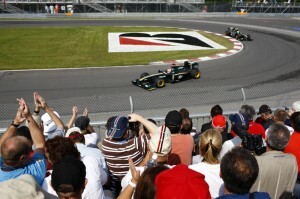 The Canadian Grand Prix made good on its promise of providing the best race of the season so far, and Lotus Racing put in a great day’s work to see Heikki Kovalainen finish the race 16th, ahead of Petrov’s Renault, after a great battle on track in what proved to be punishing conditions for the tyres for the whole field. Jarno Trulli, who had been showing quick pace right from the start, pulled over on lap 42 after a vibration at the front end led to a problem with the braking system that put paid to his race. 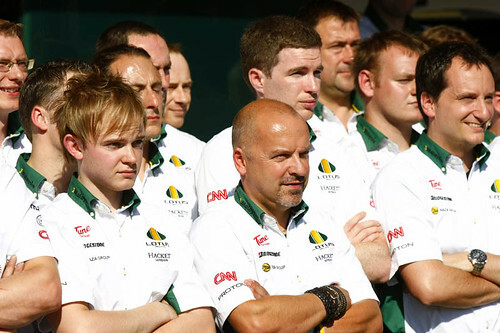 Mike Gascoyne, Chief Technical Officer: “I think overall we can be very happy with the race, and the whole weekend. The one disappointment was obviously Jarno’s problem – we will have to look at it in more detail, but it looks as though the vibration put paid to his race. Before he pulled over he was absolutely flying and the strategy would have really paid out for him, so that’s a plus. Heikki drove a fantastic race, fighting all the way with the guys in front, and kept it up right to the end to keep Petrov behind him. 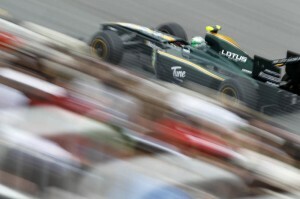 Back in Canada for Lotus Racing’s debut at Montreal’s Circuit Gilles Villeneuve and Friday’s practice sessions saw Lotus Racing comfortably ahead of their new team rivals, and edging ever closer to the midfield. 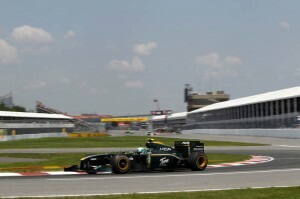 Heikki Kovalainen completed his entire program and finished FP2 less than seven tenths behind Alguersuari’s Toro Rosso, but Jarno Trulli suffered an electrical problem that curtailed his running in both sessions. 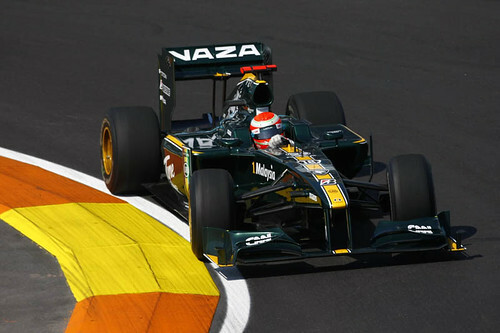 Heikki Kovalainen (Lotus Cosworth T127-01 / FP1: 24 laps, 19th, 1.21.869 / FP2: 35 laps, 19th, 1.19.969): “Both sessions were pretty good today. The circuit obviously has not been used for a little while and it was quite dirty to start with, and even at the end of the second session the grip level was still quite low, but it’s definitely improving though! It felt a bit like a Rally Finland stage first thing this morning, so it could only get better from there! Chris Harris celebrates the cult of the road racer by gathering together the very best of the breed. Renault R26.R, 430 Scuderia, GT3 RS, Exige Cup 260 and more battle it out against Colin McRaes’ 1997 Subaru WRX World Rally Championship car. The Exige clip is at the start of the second video.